On Sunday March 19th at 12pm we are proud to present the authors of this book at First Presbyterian Church in Palo Alto (1140 Cowper Street - Palo Alto, CA 94301). Fred Korematsu challenged the mass incarceration of Japanese Americans when few others did. 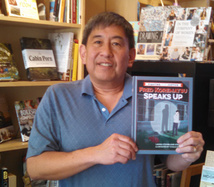 Fred Korematsu Speaks Up explores this civil rights hero's life and its relevance today. 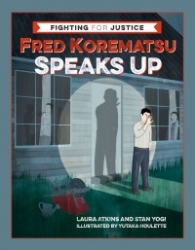 Join authors Laura Atkins and Stan Yogi to learn about Fred's lifelong fight for justice. They will read excerpts from the book, talk about the larger historical context, and lead a discussion about what people can do today to speak up for justice. The event is hosted by First Presbyterian Church Palo Alto and co-sponsored by JACL (Japanese American Citizen's League) San Mateo, Peninsula Peace and Justice Center, Multifaith Voices for Peace And Justice, and American Muslim Voice. This book starts with a simple message. Sometimes someone has to speak up for justice, and perhaps, after reading this painful, powerful, and inspiring story, should the moment come when it is needed, you may be that person. Laura Atkins, Stan Yogi, and Yutaka Houlette have taken one of our nation's ugliest injustices, the internment of Japanese Americans during WWII, and turned it into a beautiful, life-changing lesson which will influence future generations to be on the lookout for discrimination and to take a stand. The story is compellingly told, bringing Fred Korematsu back to life as a real person, struggling to survive in a situation where he is despised simply because of his ancestry, and alienated from his own family and other Japanese internees because of the stand he took against the United States government. Korematsu's name is best know because of the Supreme Court case that upheld Executive Order 9066, which authorized the internment of people of Japanese ancestry in camps after the United States declared war on Japan following the Japanese surprise attack on Pearl Harbor. Korematsu avoided the roundup and was arrested and prosecuted. The ACLU took the case to the Supreme Court which decided against Korematsu. Decades later his conviction was overturned, the United States apologized and offered reparations to those who were interned, and Korematsu was awarded the Presidential Medal of Freedom. The paragraph above describes the facts, Fred Korematsu Speaks Up makes it the stuff of legends. The book's scrapbook-style design is approachable and accessible to so many different types of readers and learners, weaving prose that humanizes Korematsu as someone to whom we can all relate, with comic-book style illustrations for the reluctant reader, spot-on photographs for history buffs, interest-grabbing fact-boxes for lovers of detail, superb use of colors, fonts,and eye-catching design elements for this generation of device-users, and thought-provoking questions to ponder which make the reader part of the action instead of being an outside observer. The book brings the story up to date with comparisons to the rounding up of Muslims after September 11th 2001 and Korematsu's crusade to ensure that nothing like what happened in WWII would ever happen again. And finally, the book offers the inspiration and tools necessary for all of us, young and old, to recognize injustice, stand up against it, and win. The authors and illustrators have given a gift to the world with their telling of this story, one which instead of needing to be "required reading" will simply be devoured by young and old alike. BUY THE BOOK - Click here to buy a copy. NOTE: The photo at the top of this story is of Derrick Kikuchi, co-founder of Reach And Teach. Derrick's father was interned during WWII. Derrick will have his father's internment camp high school yearbook at the event through which you can see what it was like to live in the camp in Idaho. Derrick's father doesn't appear in the yearbook because during the months the photographs were taken he was forced to work in strawberry fields many miles from the camp. Until the day he died, Derrick's father, Thomas Kikuchi, never ate a single strawberry.